The cool weather is here and soon our houses will be full of friends, family, and holiday cheer. Heather Bell and Jenny Engel of Spork Foods have created a delicious Pistachio Chewy Bite Bread Pudding that will be sure to please even your pickiest house guest. So whip up some holiday cheer this season and fill your house with the sweet scent of a new twist to an old favorite. This recipe will make 6-8 hearty servings. Add almond milk to a bowl. Add sugar, flax seeds, arrowroot powder, flour, vanilla extract, lemon zest, and sea salt. Whisk until slightly frothy. Set aside. Spread each slice of bread with a small amount of buttery spread and slice each piece into 6 small triangles. Place in a greased 8 x 8 baking dish, crowded together. Pour liquid mixture over bread and gently press with a fork to help bread absorb liquid. Gently fold in chopped Setton Farms Pistachio Chewy Bites. 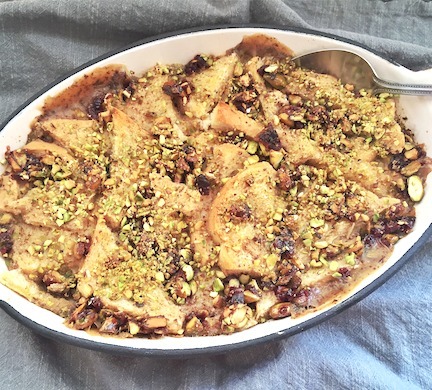 Top dish with pistachios. Bake about 38-40 minutes, or until pudding is set and top is lightly browned. (C) Spork Foods, 2015 - Reprinted with Permission. I love pistachios and to combine them with almond milk, whole wheat I four and flax seeds make this recipe. Ith more healthful and delcicious.